Industrial companies can better tailor production information to their operational needs using the new ThinManager version 11.0 platform from Rockwell Automation. The latest release of the thin client software can help improve productivity, visualisation, security and mobility in a Connected Enterprise. Companies can improve productivity using the ThinManager software’s new FactoryTalk Activation licensing option. 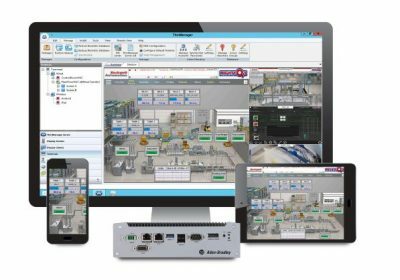 It allows an unlimited number of FactoryTalk View SE sessions to be delivered to a terminal with just one FactoryTalk View SE client license, so workers can access all the information they need to do their jobs without concerns about incurring extra costs. Traditional master licensing will also remain an option for users. The ability to make more information mobile can also improve productivity. The ThinManager software’s mobile tablet applications have been enhanced to support tiling, virtual screens and IP cameras on iOS and Android tablets. These updates allow a control-room style composite application to be delivered to mobile devices. Now, users can simultaneously monitor multiple content sources while on the move. Companies can better visualise multiple or large standalone applications using the software’s expanded MultiMonitor feature. It now supports up to seven monitors on a single terminal. This update includes support for the new Allen-Bradley VersaView 5200 Multi 4K Display thin client, which provides up to seven video outputs with 4K resolution. Version 11.0 also gives users more flexibility when navigating the ThinManager software’s touch screen. New touch-and-hold functionality can help workers more efficiently access information and make changes. Expanding on the ThinManager software’s many authentication options, version 11.0 adds a USB badge-reader module. This gives administrators a wider range of choices for how users securely access content. The ThinManager software now includes support for non-English keyboards and the ability to configure the software’s on-screen keyboard in non-English languages. These updates allow users to input data, such as passwords, using their native language and character sets. More localised support features will be added in future software releases. Next: Veolia supplied three water treatment solutions in Mbombela. CURA Software Solutions was honoured with the Da Vinci Award for Excellence in Management of Innovation in the Small Business Category at the 2018 Da Vinci TT100 Business Innovations Awards Ceremony held on Wednesday 14 November 2018. The Management of Innovation Award acknowledges how well an organisation capitalises on the ideation process to develop an innovative product, service, process or system and, in turn, how well the business commercialises and implements such innovations. This award is centred around the development, implementation and monitoring of innovative technology strategy within an organisation. Companies are evaluated their ability to maintain a competitive advantage through their incorporation of emerging, pacing, key and base technologies. Key focus is on their improvement of quality and productivity, higher flexibility, cost leadership and new market exploitation. CURA also secured a spot as small enterprise finalists in the Management of Technology, Management of Systems and Overall Excellence categories. The Da Vinci TT100 Business Innovation Awards Programme is South Africa’s foremost business Awards programme. TT100 has been recognising innovation and technological prowess in South African companies for more than 25 years. It is focused on identifying true managerial leaders who through innovation, tenacity and a belief in people, have been able to take their organisations to new levels of competitiveness. The programme seeks to identify role models within the management of innovation and technology domains who have demonstrated their excellence in co-creating new workplace realities.